On the 28th of December I had to amazing opportunity to sing the National Anthem at the 2016 Proclamation Day service, under The Old Gum Tree. As approximately two hundred people gathered for this early morning service, His Excellency the Honourable Governor Hieu Van Le and his wife arrived. After speeches by the City of Holdfast Bay Mayor Stephen Patterson and the Governor himself, I sang the National Anthem. I was accompanied by the City of Holdfast Bay Concert Band which had a few recently graduated Brighton Old Scholars. After the performance I was photographed with the Governor’s wife and the Mayor. It was an honour to represent the school at this historic South Australian event. On the 13th of December 2016, in partnership with The Very Reverend Frank Nelson, Dean of St Peter’s Cathedral, we developed a new format for our Christmas carols service. 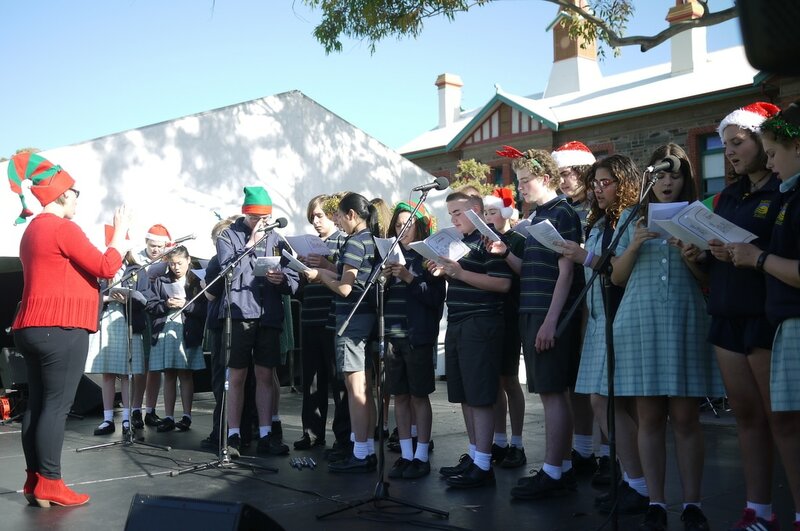 Brighton Festive Carols showcased our choirs and Brass Ensemble with contributions from Esmond Choi and Amelia Monaghan on recorder. Students read verses from the gospel according to Matthew and Luke in a service that focused on light, joy and singing. Special thanks to Emma Borgas for her stupendous contribution to this celebration. 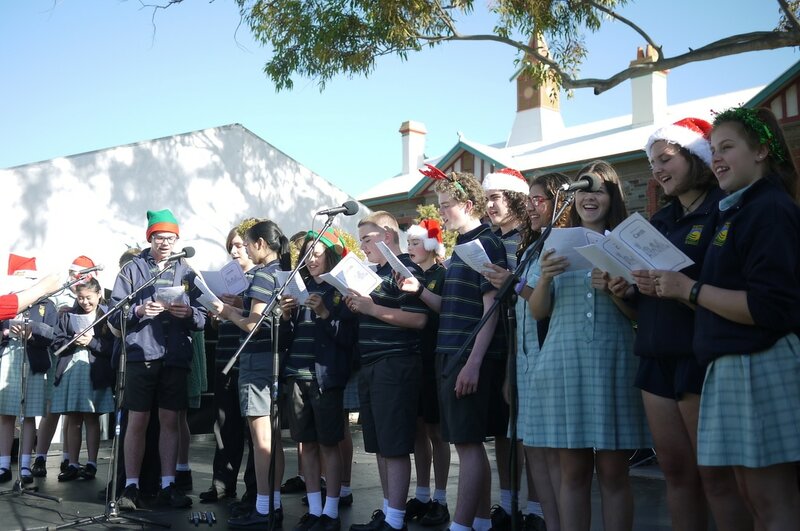 ​On Friday the 9th of December 2016, Brighton Secondary School took part in MINDA's Christmas celebration, Carols on the Lawn. Emma Borgas and Andrew Barrett took the Treble and Boys Chamber Choirs to perform a short set of well-known carols. 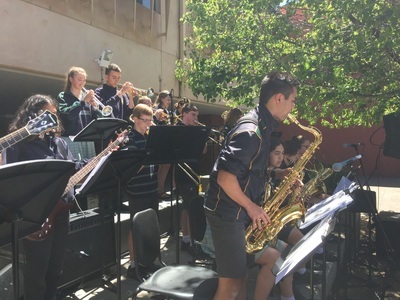 Special mention must be made of the choristers who jumped straight off the bus from the Concert Band regional tour to participate in this community event. On the 7th of December, the Brighton Secondary School Concert Band left for a regional tour to the Copper Triangle. We performed at many primary schools and learnt a lot about becoming a better musician. This tour was an incredibly rewarding experience, and I highly recommend that all music students make the most of opportunities like these. ​Before we left to our first destination, we had an all day rehearsal. In the rehearsal, we polished up our repertoire and focused on elements such as dynamic contrast, tone and style. We then split up into our sections and learnt a piece which showcased the sound of that particular instrument family. During the tour, we got to learn many performance skills which could help us in future performances or auditions. Some of these skills include having stage presence, getting the audience involved and being confident in front of larger groups. One of the most surprising things was the amount of audience participation we got. It was great to see the audience get involved and enjoy our performances. One of the highlights of the trip was getting to know the other members of the ensemble who you didn’t know very well. We developed friendships with students from other year levels and learnt more about other members. On one night, we held an ‘Anti-Talent Night’ which was a chance to have a laugh and talk to people you wouldn’t normally talk to. Overall, this tour was an amazing experience, and I encourage everyone to participate in a tour like this. It was an opportunity to learn many things (not just in regards to music), which will be very valuable in future years. On Tuesday the 15th November 2016 the Year 8, 9, and 10 students put on a 2-hour concert showcasing a selection of their repertoire from the year. All core music students participate in Choir and one instrumental ensemble: Band, Strings or Percussion. 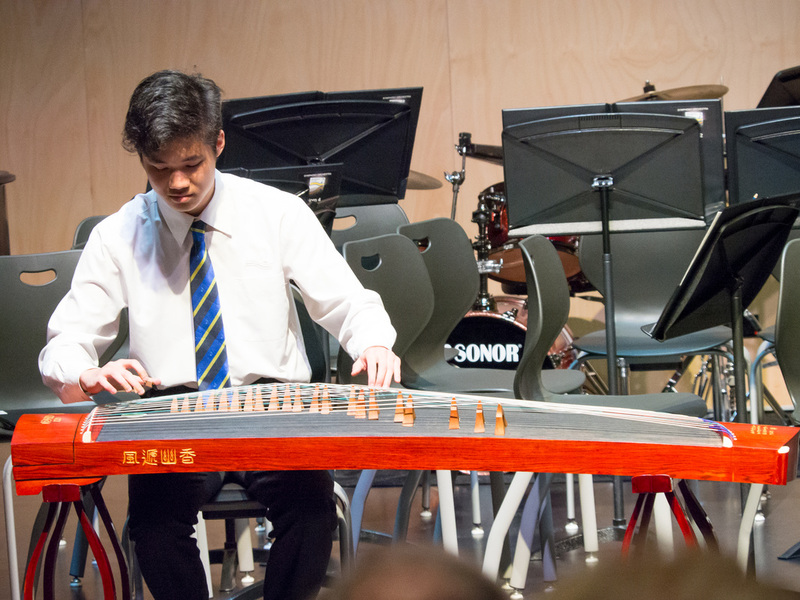 The evening gives all parents a chance to see what can be achieved in a focussed Music program such as Brighton's. On Monday the 31st October 2016, Brighton Secondary School held its annual Valedictory evening at the Adelaide Convention Centre. The night gives staff and students opportunity to reflect on their journey together throughout high school. Travis Collins (guitar) and Francesca Olds (voice/piano) performed while students, parents and staff entered the room. A Year 12 Choir opened the ceremony with the National Anthem. Throughout the evening we were treated to small group and solo performances by Simone Brock (voice), Tom Galindo (piano), Christopher McDonald (euphonium), Jessica McDonald (trumpet), Jim Morris (piano), Gillian Taylor (voice), and Kimberly Wong (piano). Head of Music, Andrew Barrett presented the 2016 Head of Music Award to Christopher McDonald and Kimberly Wong. The award recognises students who have shown particular talents in music, the potential to develop these talents in tertiary study, and an outstanding contribution to the Special Interest Music Centre during five years of Music education at Brighton Secondary School. 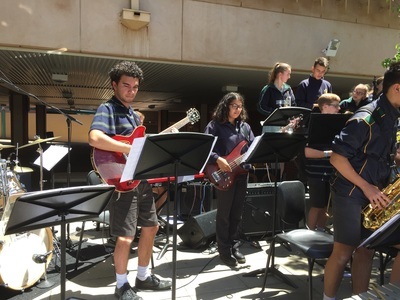 The evening concluded with a rap composed and performed by Yanni Comino-Ewen, accompanied by the Year 12 ensemble. On Friday the 28th of October 2016, Brighton Secondary School's annual Jazz Cabaret was held at The Grand Ballroom. 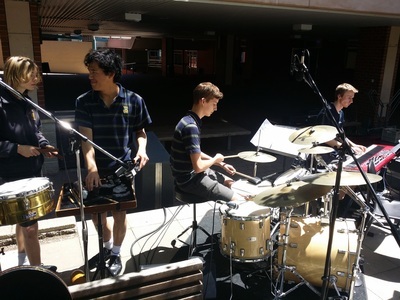 The night kicked off with entry music performed by a small jazz ensemble made up of Year 10 students. They have performed regularly together throughout this year at school events. The members are Lizzy Hartley, Marcus Formato, Yoni Rex-McGirr, Angela Winter, and Alex Witty. 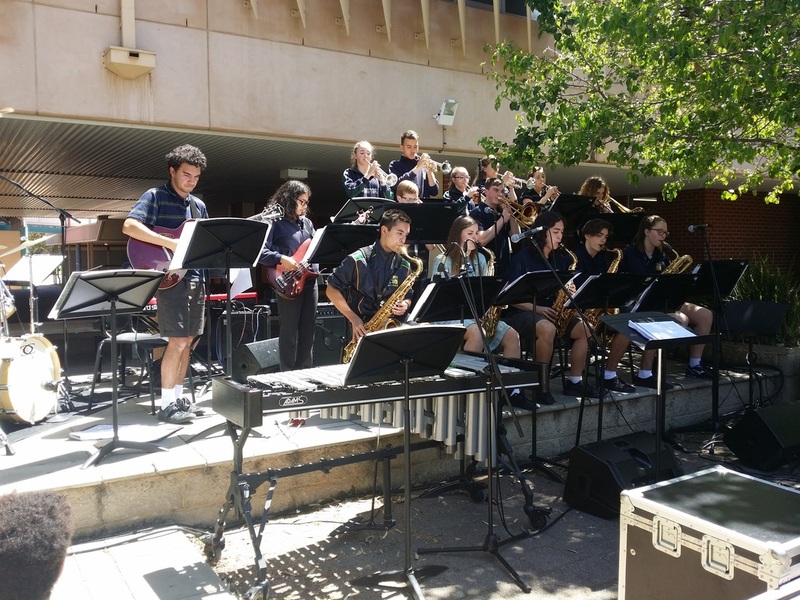 The James Brown Experience, a 12-piece ensemble formed to develop the improvising skills of students. 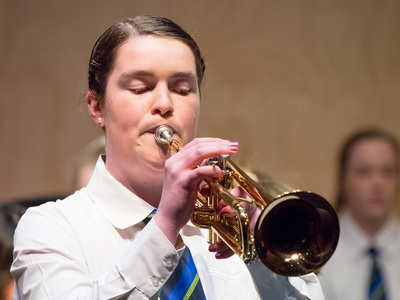 They played several of their own compositions and standards which featured cool grooves and lyrical soloists. The 'house band' of Andrew Barrett (piano), Mark Cameron-Smith (bass), together with drummers Tim Braslavskiy and Oliver Ryan accompanied three 'featured soloists' as they sang Honeysuckle Rose (Jessica Delbridge), Adele's Daydreamer (Amber Timms) and the Latin classic, Besame Mucho (Gillian Taylor). The next set featured more soloists performing songs in keeping with the theme of the night - 'Latin': The Look of Love (Sofia Dilettoso), Dindi (Kayla Ikeeboh and Michaela Higgins), and Perhaps, Perhaps, Perhaps (Chloe Bentley with Craig Bentley, Cheryl Bentley and Dylan Bentley). The soloists' set concluded with a duet of the most recognisable Latin Jazz standard, The “Boy/Girl” from Ipanema (Olivia Hallam and Hanz Matutina). The Jazz Cabaret coincided with the Year 12's final day of scheduled lessons. We said goodbye to Year 11 International student Mathis De la Motte, and Year 12 students Travis Collins, Tom Galindo, Louis Gillespie, Bailey Heading, Sabrina Larouche, Isabel Mawby, Christopher McDonald, and James Tamblyn. The evening finished with Big Band 3 (Big Band 1 and 2 added together) playing Soul Bossa Nova - most recognisable from the Austin Powers motion picture. 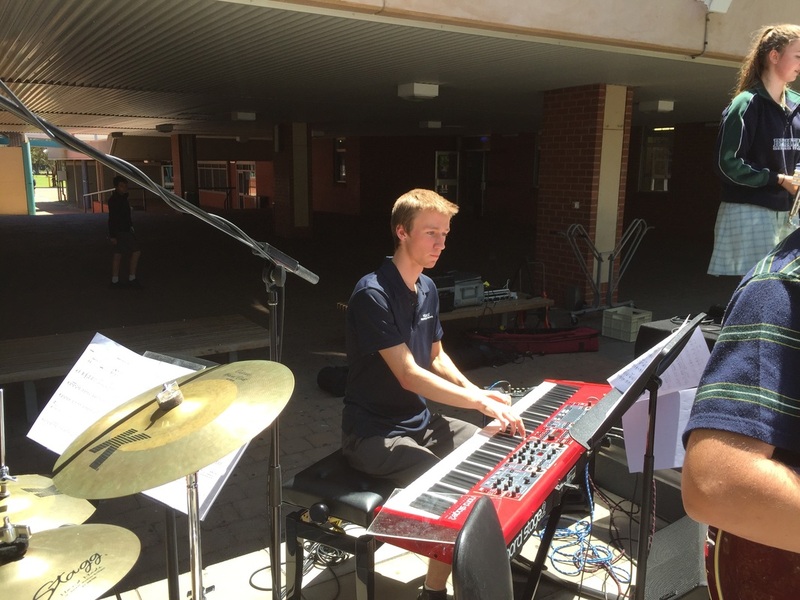 Special thanks to Josh Smart, Billy James and Year 11 Sound Technology class, Brett Curruthers, and Pam Parsons for all their work in the lead up to, and during, what was another brilliant evening of music. Thanks also to Alexander Pickering for the photos. 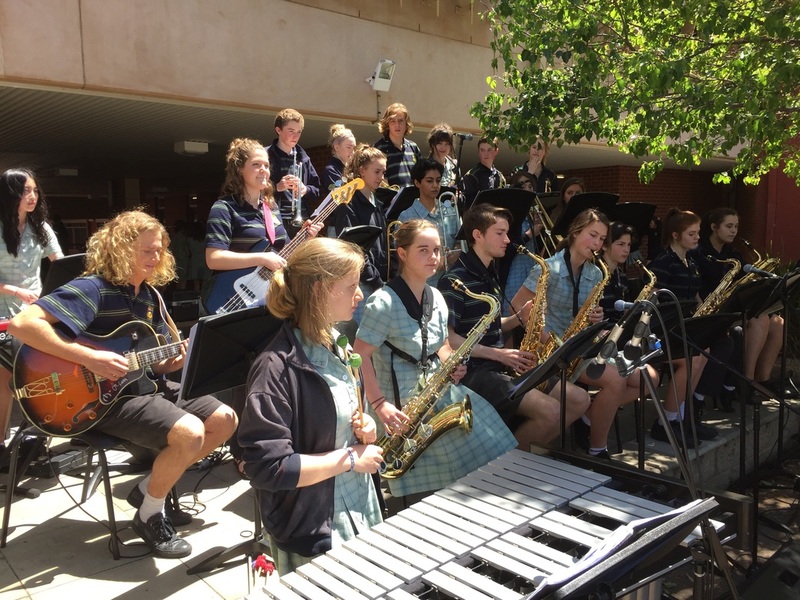 On Thursday 27th of October 2016 the Big Bands put on a short concert at lunch time under the trees in the quadrangle. 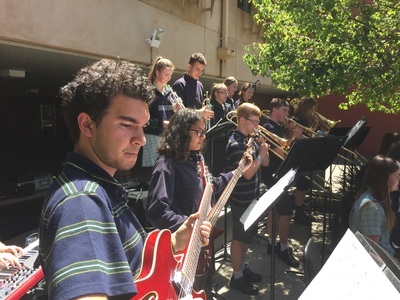 Just one day out from this year's Jazz Cabaret, the bands took the opportunity to play 3 songs each to an appreciative audience of staff and students. 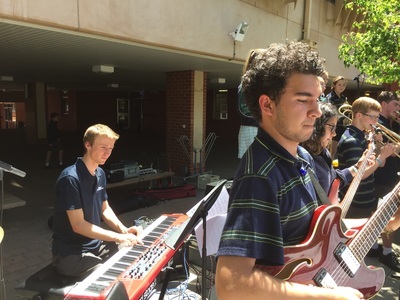 Special thanks to Mr James and the Year 11 Sound Technology class who spent the two lessons prior to lunch setting up an impressive array of sound gear and then produced a stunning mix to complement the bands' wonderful performances. On Saturday September 10th 2016, Brighton held its annual Music Spectacular concerts. This year marks the 40th anniversary of the Special Interest Music Centre and our Music Spectacular concerts celebrated this milestone. 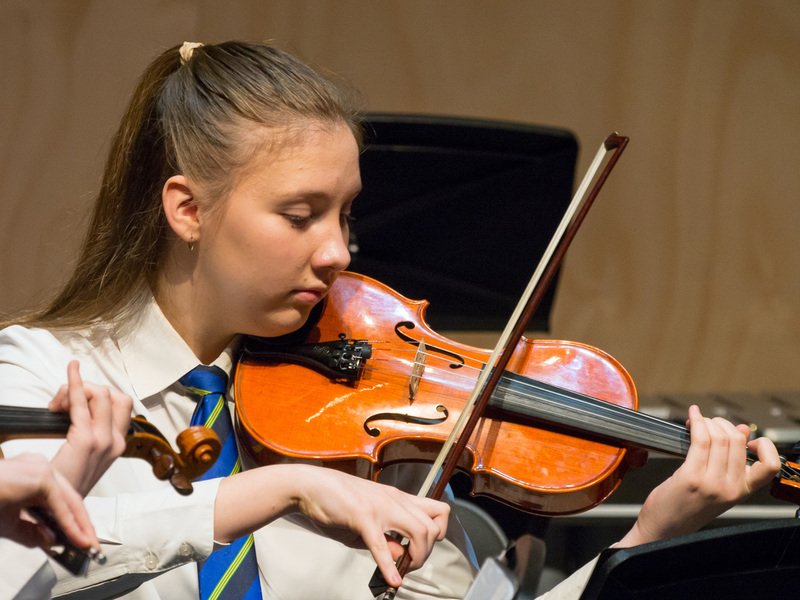 The matinee showcased primarily our junior ensembles as well as a visiting string quartet from Marryatville High School (also celebrating their 40th anniversary). 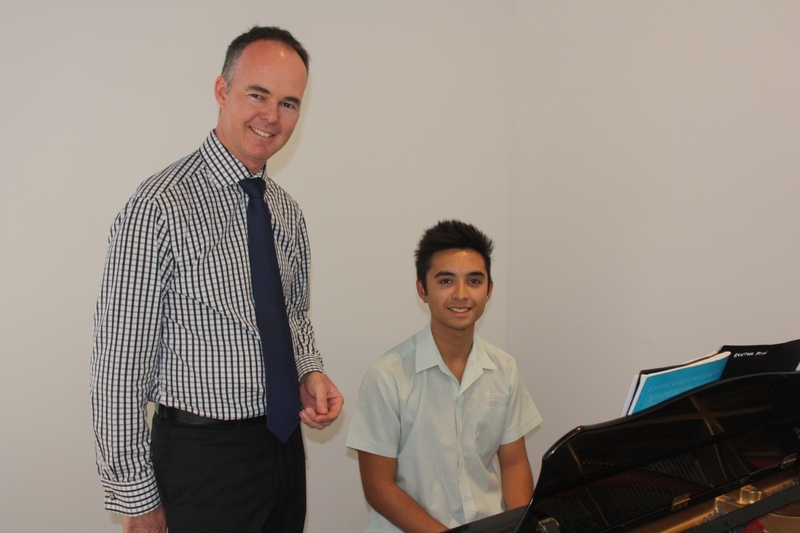 In recognition of his stupendous contribution to Brighton Secondary School, we welcomed back Jeffrey Kong in a performance of Franz Strauss’ Nocturno for horn and piano (Sarah Barrett, horn). 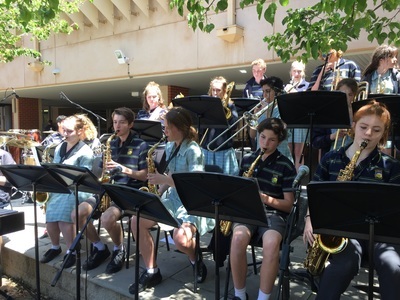 We were also delighted to include the Beachfront Hub Senior Band in our Music Spectacular for the first time. 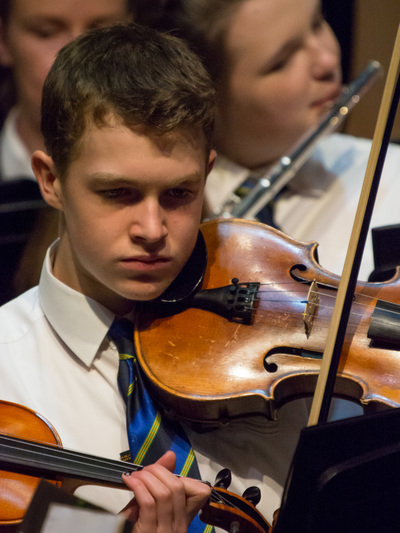 The 1970s (’76 in particular) were the theme of the evening performance with many ensembles honouring the 40-year milestone with pieces from this time. Brett Carruthers and his tech team went to town (including a disco ball suspended from the Concert Hall ceiling) in a sound and lighting extravaganza, adding a real party atmosphere to this event. 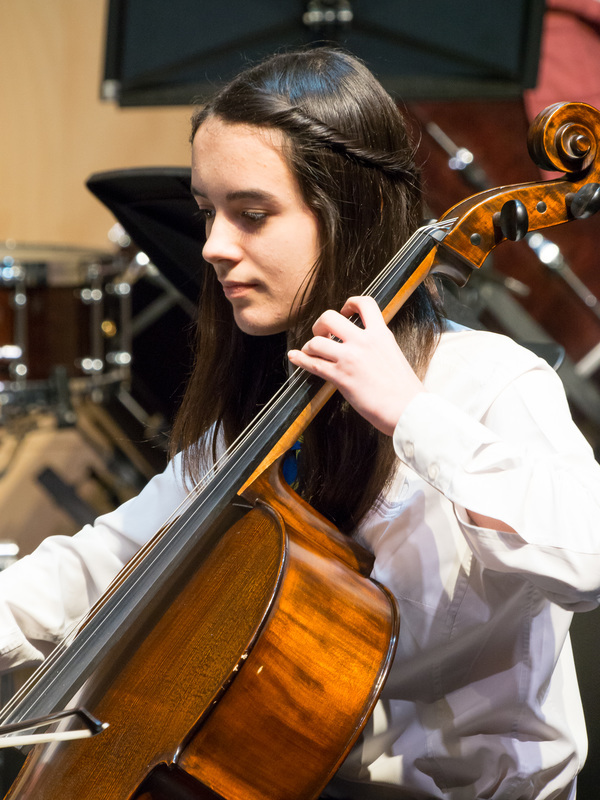 After interval, Olivia O’Neill set an historical context before handing over to Old Scholars Sandy Hosking, Rob Chenoweth, Kym Waters, James Brown and Sam Hicks who recounted fond memories through the decades of their time as music students. Special thanks to Cheryl Evans and her team for creating the laser cut '40th Anniversary' plaque, presented to Olivia O’Neill by Jeffrey Kong. 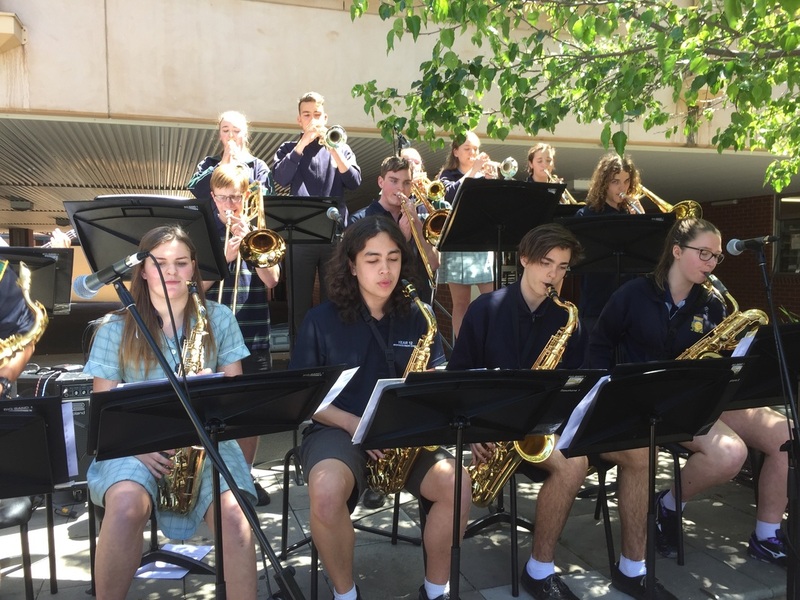 As the evening drew to a close, we took a moment to farewell our Year 12 music students before Big Band 1 blasted the audience home with a rousing rendition of the Rocky theme song. The program from the concert can be viewed here. Thanks to Michelle Hanlin for the photos. 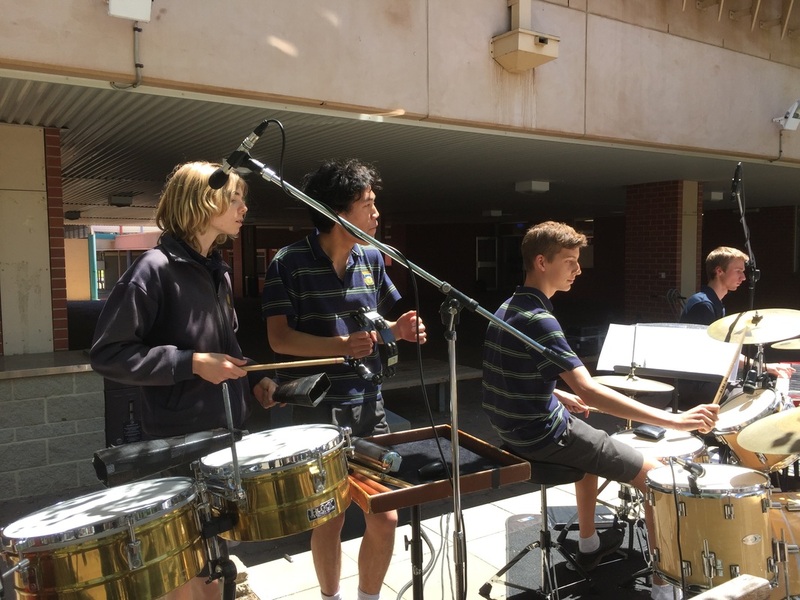 ​The annual Percussion Showcase was held on the Wednesday 31st of August 2016. This was an extremely well-run event by Billy James (ably supported by Mike Gillard) and demonstrated all facets of percussion playing from our students in ensembles and as soloists, as well as some guest performances by Jamie Adam’s ensemble and Adelaide University’s Andrew Penrose. Old Scholars Madison Chandra and Jack de la Lande also took part in this event. 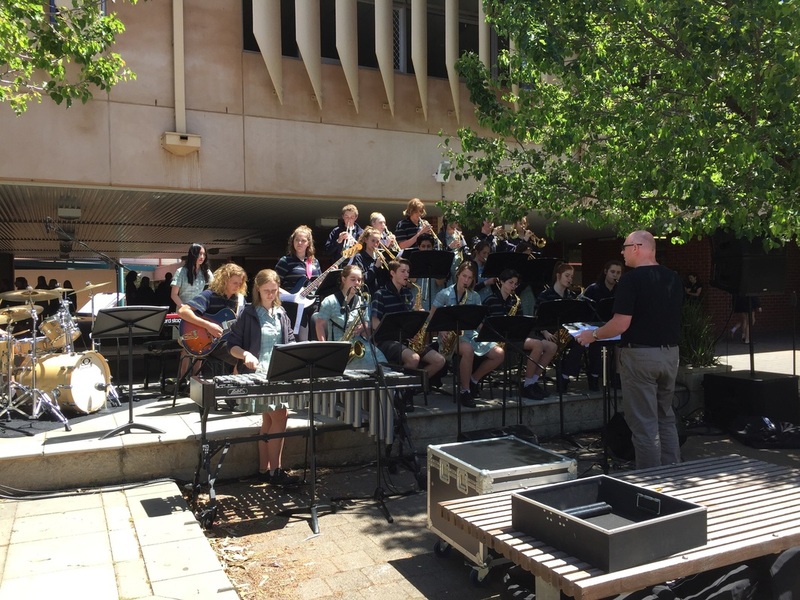 The annual Australian Band and Orchestra Directors’ Association festival was held on Wednesday 24th and Thursday 25th of August 2016. 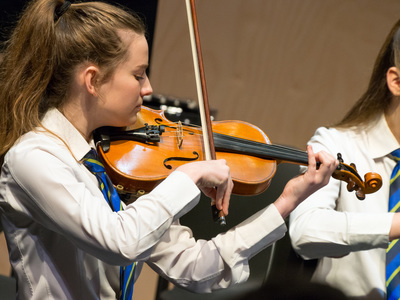 This year was yet another successful campaign for our ensembles at the ABODA Band and Orchestra Festival. Our Percussion Ensemble 2 was awarded a silver placing while the Concert Band received a gold award. The standout performance was by Percussion Ensemble 1 who were crowned state champions. 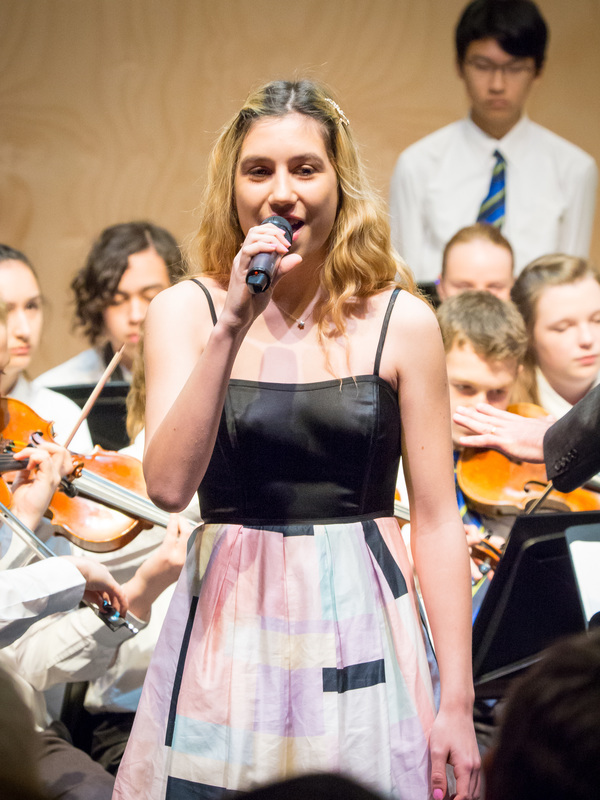 On Saturday 20th of August 2016 the Brighton Concert Choir joined together with choirs from St Mary’s College, Christian Brothers College, St Peter’s College and Young Adelaide Voices to present a combined concert in our Concert Hall. When Icicles Hang, a choral work by John Rutter, was the main featured work in the program and celebrates the theme of Winter in all its guises. 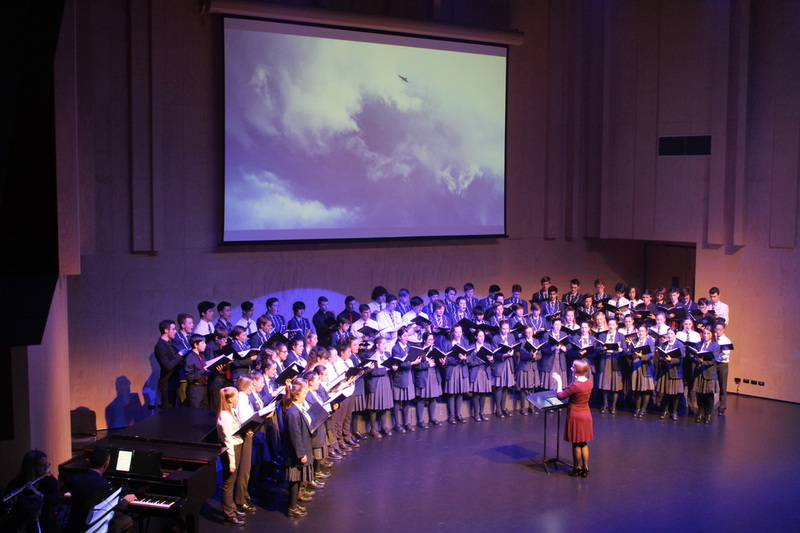 The Concert Hall was the perfect venue for the combined 150-voice choir which was accompanied by piano and two flutes as well as tenor soloist Jim Zhang. These instruments conjured up the haunting atmosphere of bitter winter winds, soft falling snowflakes and birds in bare trees as these images were also displayed on the big screen above. The first half of the concert featured each choir performing their own repertoire and all groups presented at a very high level. There was a great variety of pieces which ranged from the relaxed, bluesy piece by Otis Redding Sittin’ On The Dock Of The Bay, through to Mary Lynn Lightfoot’s Tiger! Tiger! with text by William Blake and Thulele Mama Ya a Zulu wedding celebration song. The concert was such a fantastic celebration of choral music and fulfilling project of collaboration between schools. Overall, the project raised $1200 in donations which will go to the St Vincent De Paul Society. 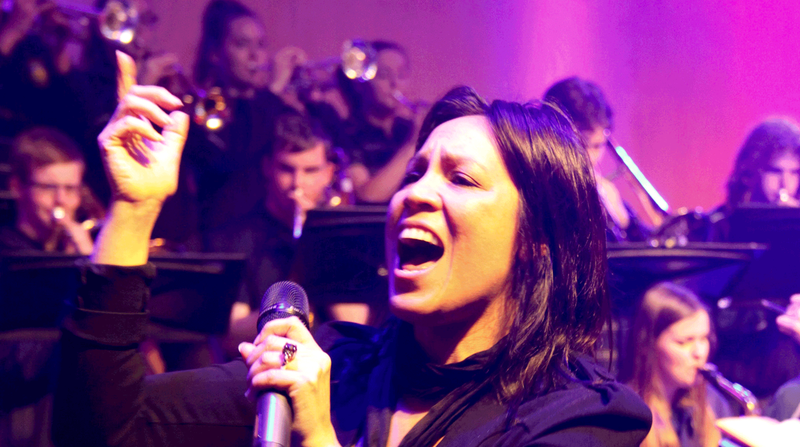 ​In a new initiative for Brighton Secondary School, brought about by a fortuitous chat over a cup of coffee by Music Coordinator Craig Bentley at the Generations in Jazz Festival in Mt Gambier, we were able to secure the services of Australian music legend, Kate Ceberano as an Artist in Residence from 2nd to 4th August 2016. During her visit, Kate worked with 200 music students through vocal masterclasses, music industry talks, song-writing workshops and rehearsals with the orchestra, Big Band 1, the JB Experience and several choirs. 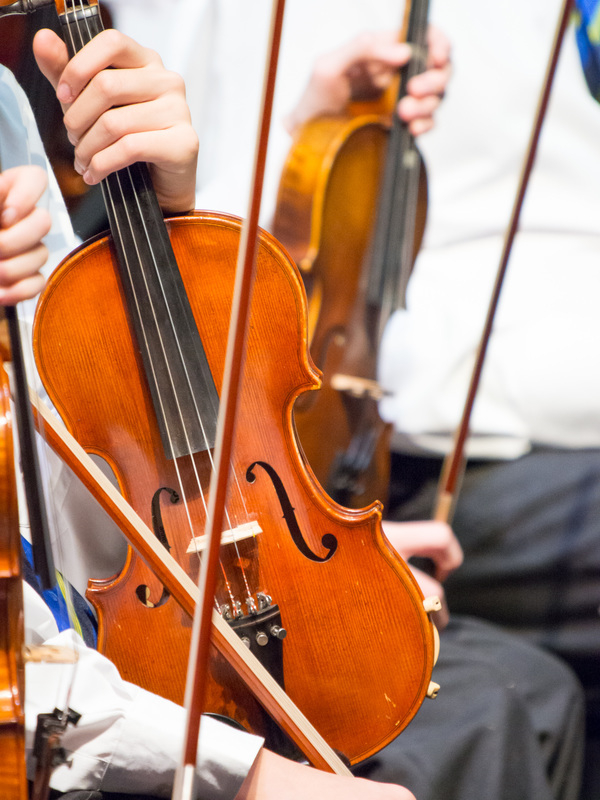 The Chaplains’ Concert is the major event of the Music calendar that celebrates stringed instruments and string ensembles. 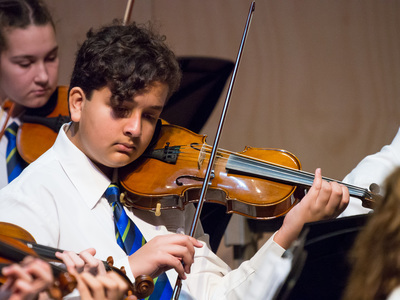 On Sunday the 3rd of July 2016 our junior string ensemble, Sinfonia (directed by Roland Dankbaar), opened proceedings with a highly entertaining and varied program featuring a composition by Year 9 student, Hamish Madden. 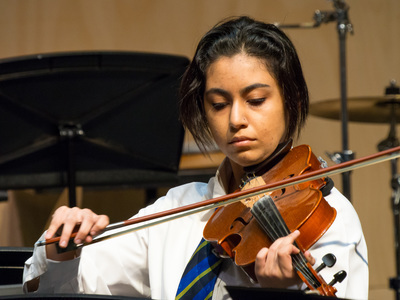 The first half concluded with the Amoroso String Quartet (Emma Richardson, Lauren Owens, Kiran Sachdev and Charlotte Rayner) performing a Tango composed by Andrew Barrett. Mae Napier-Traeger (violin), Mattea Osenk (viola) and Jos Lum (Guzheng) performed solos to open the second half before the symphony Orchestra took to the stage. Their program, spanning Haydn to Hollywood, featured solos from Jessica McDonald (trumpet) and Simone Brock (voice). The concert was a great success with all proceeds going to support the Chaplains’ Programs in southern schools. 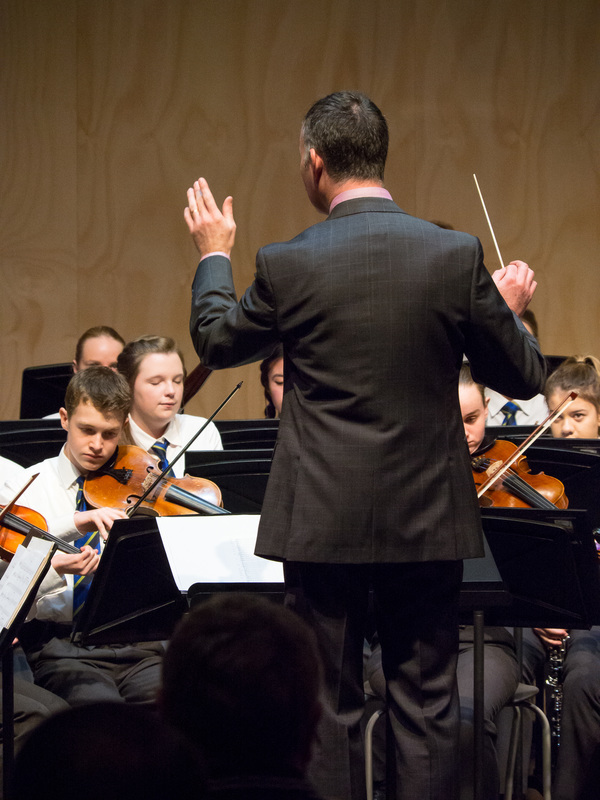 On Friday the 13th of May 2016, the Elder Conservatorium Wind Orchestra came to Brighton's Concert Hall to perform to our Year 8 students and members of our Concert Band. 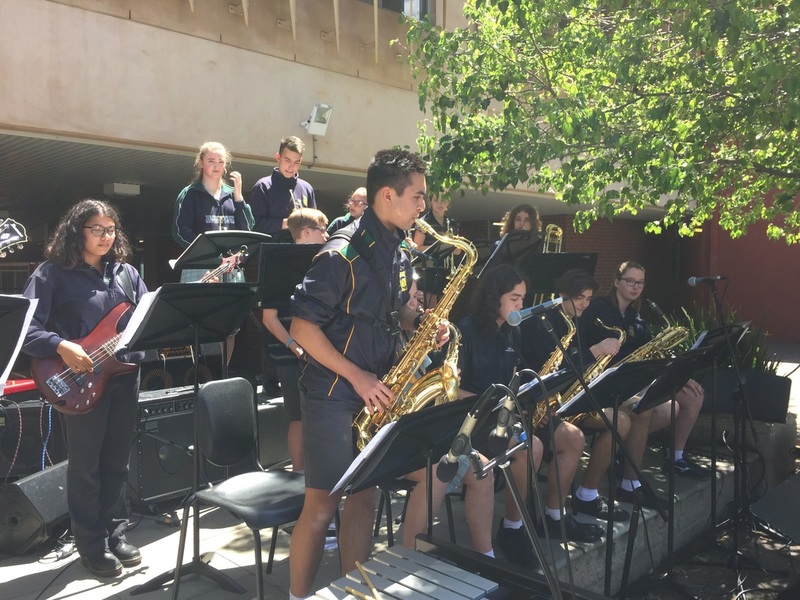 Our students were treated to a varied program in which the Adelaide University students demonstrated exceptional skills on their instruments. 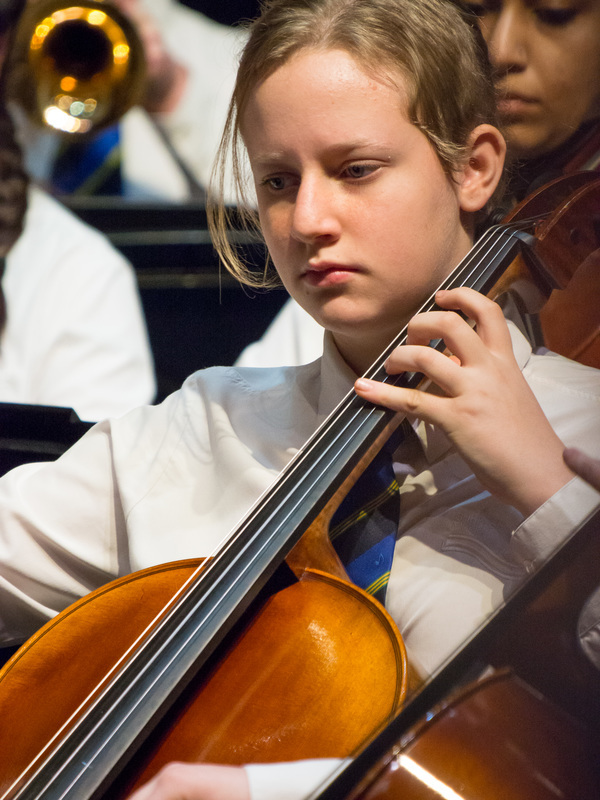 The orchestra includes old scholars Emily Legg (tuba), Rebecca Adams (French horn), and Kaya Nicholls (piccolo) who made us proud through their continued development. A highlight of the concert was the opportunity Brighton students had to stand over to the orchestra's musicians while they played. This gave them a wonderful insight into the rich blend of sound possible in a wind orchestra. 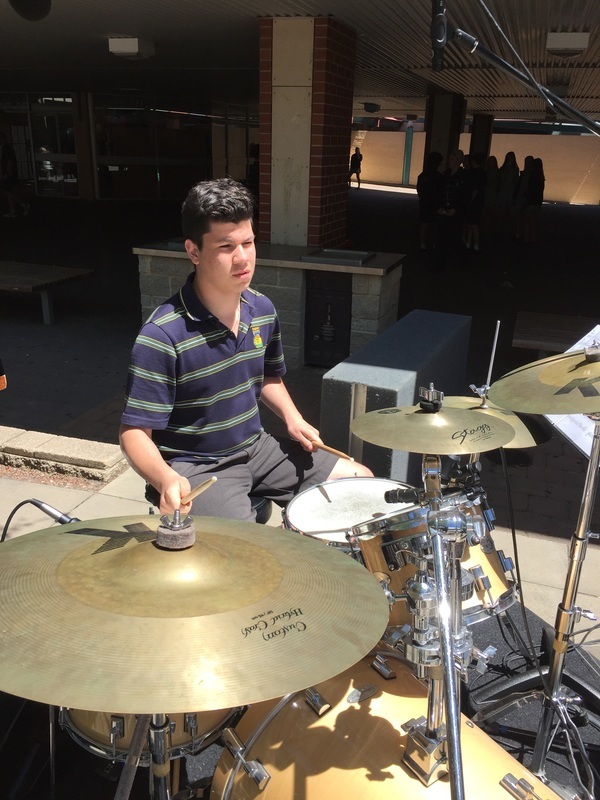 On Friday the 13th of May 2016, Brighton students Ben Waltho and Isaac Byrnes were joined by Charlie and Jaya to present a rocking set of tunes to raise funds for Can:Do 4Kids. 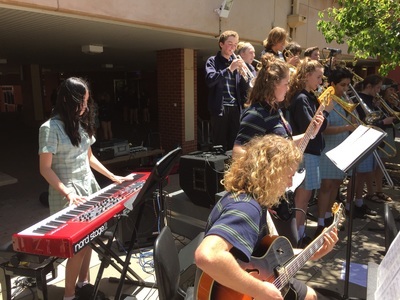 Together their band, Experiment One performed for 40 minutes at lunch time to a highly appreciative crowd of staff and students. ​Last weekend I had the amazing opportunity, along with other music students and staff to go to Generations in Jazz in Mt Gambier. Generations in Jazz is one of the biggest Jazz festivals in Australia. It is hosted by James Morrison who is a famous trumpet player. Every year he encourages famous musicians and vocalists from all around the world to perform with him at the festival. Brighton Secondary School was represented by two big bands and a Jazz choir. Two buses took us down to Mt. Gambier where we stayed in a motel. On the first evening we were welcomed by an opening concert which took place in the big marquee sitting seven thousand people! 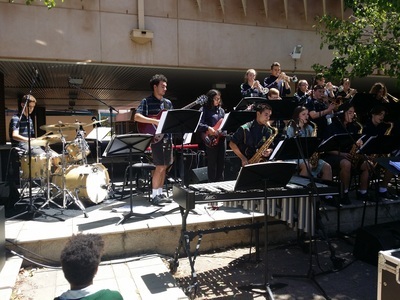 On Saturday morning, our ensembles played in their divisions in front of famous musicians who judged the performances. On Saturday evening, we saw a concert featuring the One O’Clock Lab Band from the University of North Texas, which is the best university big band in the world. It was a blast! All of us were amazed of the performance. The next morning we could choose between a vocal and instrumental workshop held by the professional players. These workshops helped us a lot. In the afternoon we saw a final concert featuring the super bands that included the best student musicians from each division. The weekend included with some tasty pizza on the road after an endless drive home. This was a remarkable experience and from it we will grow into better musicians. Thanks again to all the teachers for your support and the Woollies run. Thanks for the jumpers that got us the award of the best-looking school in the whole festival. ​Photos courtesy of Gordon Lindqvist and Britt James. 25th April 2016 - We were once again able to show our appreciation for the ultimate sacrifice made by Australians and New Zealanders in war by singing at the ANZAC Day Dawn Service at Brighton Jetty. This year, the responsibility of a 5am start in the middle of the school holidays rested on the shoulders of the Boys' Chamber Choir who were strong in number and voice. On Thursday the 14th of April 2016, Big Band 1 and 2, and the GIJ Choir (Concert Choir) performed their pieces in preparation for Generations in Jazz. Below are the videos that students used to review their performances and focus their rehearsal time for the weeks leading up to the competition. ​On 12th April, we were treated to a visit by the Mid North Coast Youth Orchestra on the final leg of their south-eastern tour. ​Our Sinfonia, directed by Roland Dankbaar, participated in an open rehearsal with the visitors in the Concert Hall. Students from both groups had spent several weeks preparing each other’s repertoire, culminating in a wonderful exchange of musical ideas on the day. As always, it was great to see young people from different parts of the country finding common ground through music. In keeping with Brighton Secondary School’s tradition of supporting student initiatives, staff and students collaborated on the 6th of April 2016 to present a fundraising concert for Camp Quality ahead of Jessye Campbell’s inspirational 1,000Ks 4 Kids bike ride. Jessye and her mother Trish worked with music staff, the Treble Choir and Jessye’s friends to piece together a varied concert program. 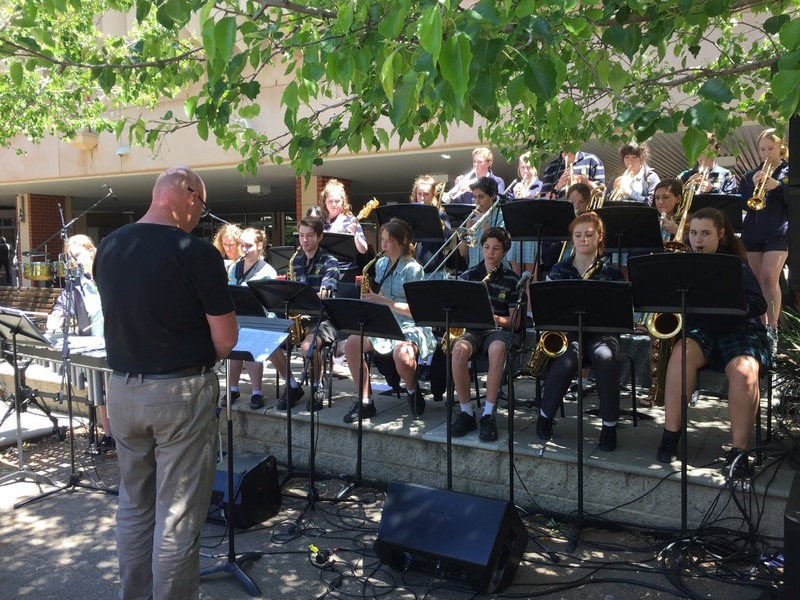 Special thanks to teachers Ben Smith and Cheryl Bentley, and students Kayla Ikeeboh and Mikayla Link for singing backup vocals in the concluding staff band item, “Cycling Jessye” (a reworking of the song, “Mustang Sally”). Tuesday the 8th of March 2016 was International Women's Day. 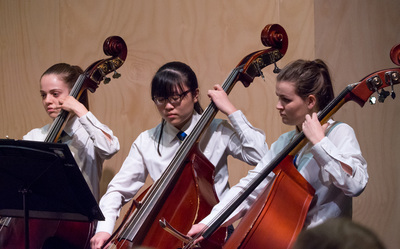 As part of the month-long celebrations and recognition a number of students from Brighton performed at the Adelaide Convention Centre. Courtney Miller attended with the “Amoroso” String Quartet (Emma Richardson, Lauren Owens, Kiran Sachdev and Charlotte Rayner) who received a special mention and thanks from the compere of the evening. On Monday the 7th March 2016, Brighton Secondary School held its Annual General Meeting in the Brighton Theatre. 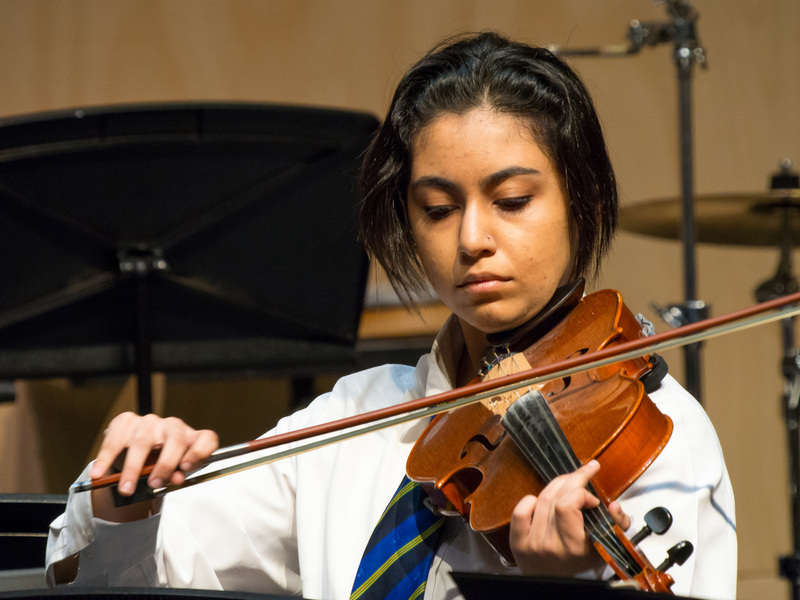 The entertainment during the evening was the “Amoroso” String Quartet (Emma Richardson, Lauren Owens, Kiran Sachdev and Charlotte Rayner), and the jazz combo featuring Yoni Rex-McGirr, Alex Witty, Angela Winter and Marcus Formato. On Friday the 26th February 2016, Years 8 to 10 students gathered in the school's gymnasium to acknowledge 2016's student leaders and recognise excellence at Brighton in academic and sporting realms. Big Band 1 played a number of pieces while the audience were being seated and then played the National Anthem to begin the ceremonies. A jazz combo comprising Yoni Rex-McGirr, Alex Witty, Angela Winter and Marcus Formato also performed during the assembly. On Thursday 25th of February 2016, Adelaide's renowned Latin/World Music expert and lecturer of Jazz studies at Adelaide University, Mark Ferguson held a workshop with the 'rhythm section' players from Big Bands 1 and 2. The focus was on the traditional rhythmic styles of Latin music. The students explored the interlocking patterns on their specific instruments that make up the foundation of the Afro-Cuban feel which is popular in a number of Jazz genres. 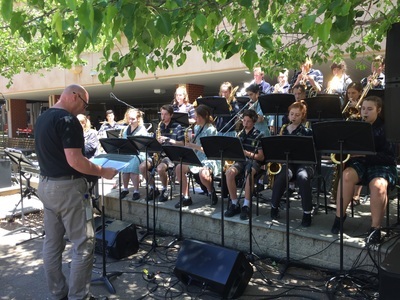 This knowledge will be developed throughout the term in the lead-up to the bands' performance at James Morrison's annual Generations in Jazz music festival. Held in Mt. Gambier since 1987, this year, Brighton is being represented this year by two big bands and a jazz choir. 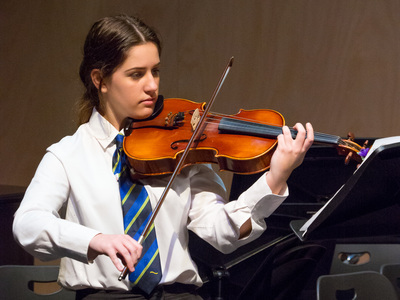 On Wednesday the 24th February 2016, an information evening was held for parents of Year 8 students studying Music. 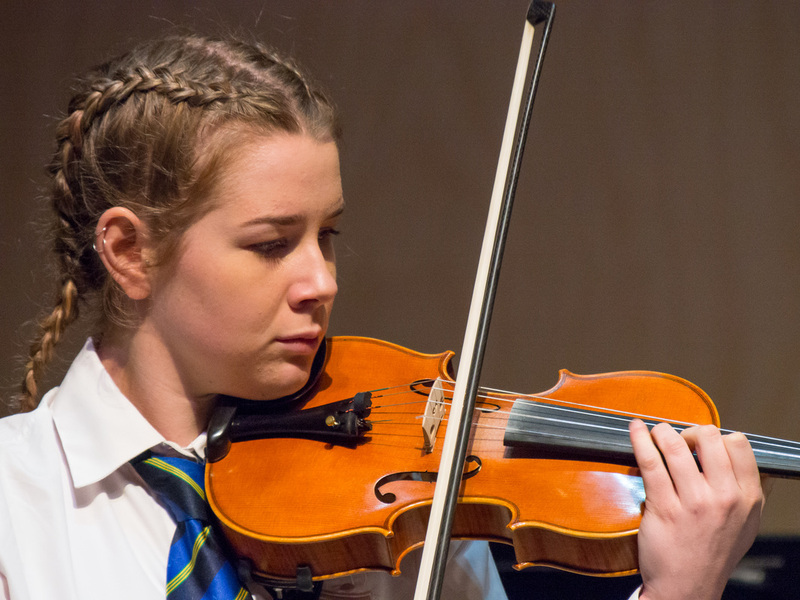 The night started with performances by students demonstrating some of the musical styles and instruments studied at Brighton. Andrew Barrett then spoke about the Music Program and introduced the staff, Craig Bentley talked about the day to day requirements for students, and Michael Sard introduced himself as Chair of the Music Parents Support Group as he showed the parents ways in which they can aid their child's development. Special thanks to the students who performed: Jereyll Chia (piano), Jayden Doe (flute), Kita Finlay (cello), Stephen Badger (euphonium) and Simone Brock (voice). On Wednesday the 17th February 2016, Ashton Milton-Hine performed on piano as background music in the foyer of the Brighton Concert Hall. The following evening, Mikayla Link sang and played piano to entertain the crowd in the foyer. Thank you to them both. 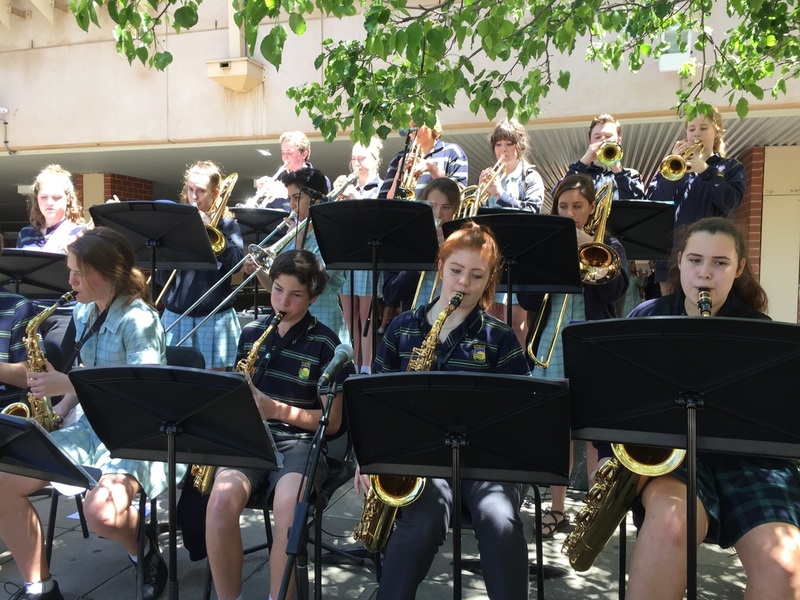 On Tuesday the 9th of February 2016, Big Band 1 performed in the grounds of Government House, Adelaide as guests arrived for the 2016 SACE Merit Ceremony. The band played for 50 minutes before the brass players joined students from the other Special Interest Music Centres (Woodville, Marryatville and Playford International College). 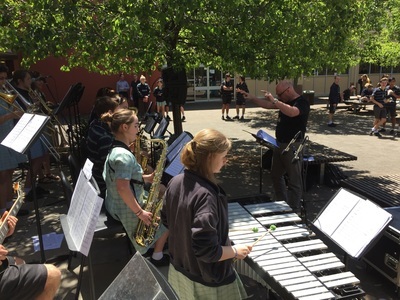 Considering the early start to the day (7:00am bus departure from school), the extremely hot weather, and the very short preparation time of two rehearsals, the ensemble acquitted itself in a very professional manner.